Boat shows are one of the top influencers of boat-buying decisions, behind dealership experience and the Internet, according to the 2010 Boat Show Purchase Influence Report. The report is based on a survey of 3,295 buyers of new powerboats who purchased between January 2009 and August 2010. Conducted by Foresight Research, the survey looked at eight powerboat segments, from pontoons and aluminum fishing boats to cruisers, and divided the participants into seven geographic regions. Thom Dammrich, president of the National Marine Manufacturers Association, notes that this finding should be of particular interest to those who participate in the association&apos;s boat shows. "This is significant for NMMA show exhibitors who participate in the NMMA Advantage program," he says. "NMMA Advantage combines the reach of online advertising with the power of on-site selling - it bridges the gap between the three most influential marketing channels, bringing together the dealer, Internet and boat shows." This new report analyzes all marketing channels that play a role in a new-boat buyer&apos;s decision-making process, offering insight for dealers and builders about how to best structure marketing plans to maximize results. "In an era when every dollar invested in marketing needs to deliver a measurable return, the data in our all-encompassing &apos;U.S. Boating Industry Marketing Communications Influence&apos; report is invaluable, revealing information marine businesses can use to evaluate their marketing communications mix and strategically coordinate their marketing efforts to maximize effectiveness," says Ron Hein, executive vice president at Foresight. The study found that prior to purchase the average boat buyer sought information from more than four sources. The Internet, word-of-mouth advice, boating magazines/publications and boat shows were the sources cited most frequently. A boat buyer&apos;s age makes a difference in terms of the influence of a marketing channel. 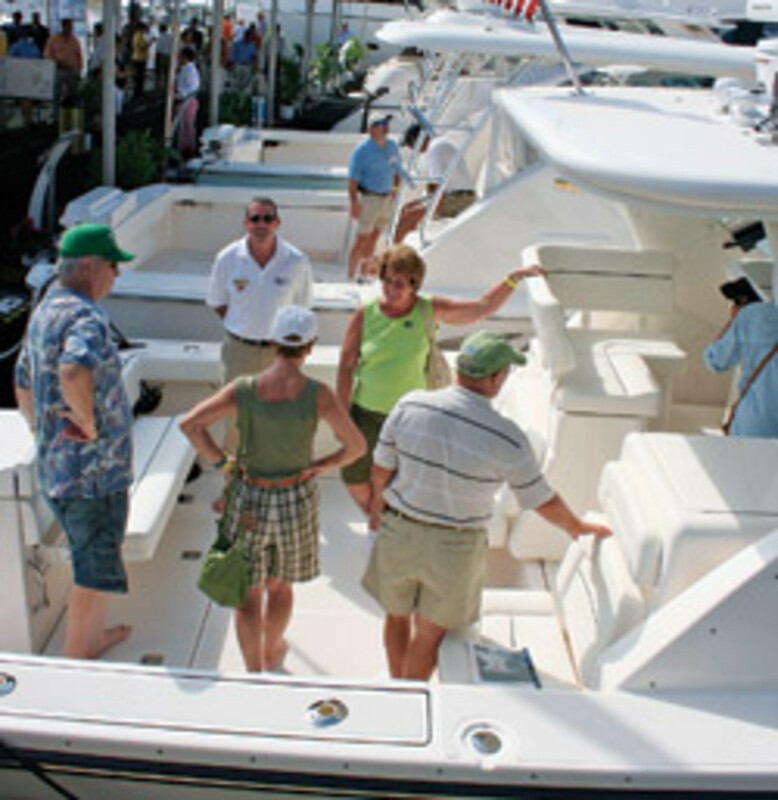 For example, boat shows were more influential to buyers ages 35-54 than they were to buyers ages 18-34 or 55 and older. Buyers said they attended an average of 1.8 boat shows before making their purchase, although that figure varies by type of boat purchased and region. Buyers of fiberglass fishing boats, for example, reported going to 2.7 shows. Radio, TV and newspaper ads are the key ways consumers find out about shows. Boat shows are a key influencer in the decision-making process because of consumers&apos; ability to compare prices and models and see and climb aboard boats. "This is kind of the one-two punch," Hein says. Most people who attend a show - 61 percent - got the information they needed at a show to make a buying decision, the research shows. The study found that 64 percent of people go to a show planning to visit the display of a brand they want to buy, although 36 percent came across the brand they ultimately purchased. Consumers spent an average of 49 minutes at the display of the brand of boat they ultimately purchased. There&apos;s an average of 3.3 months from the time of the boat show until the time of purchase, Hein says. "The boat show influence is not done after the first month or two," he notes. Most people travel about one hour to get to a boat show, although in some regions - such as the Mid-Atlantic - that time climbs to 2.3 hours, on average. The survey also looked at behaviors in the year prior to buying a boat and found that 84 percent read information on the Internet, 75 percent received advice from others, 64 percent read a boating magazine or publication, 57 percent attended a boat show, and 15 percent discussed boats on social media. Hein says 41 percent of participants said they had attended a boat show as a child, showing the importance of creating a family environment at a show. "It&apos;s probably a good investment for the future," he says. The study was funded by a group of industry organizations led by the NMMA, including the Lake Erie Marine Trades Association, Michigan Boating Industries Association, Southern California Marine Association, Boating Trades Association of Houston, Southwest Florida Marine Industry Association and Show Management Inc.
NMMA members can download a free copy of the report from the association&apos;s website. Non-members can purchase it for $3,600 by contacting Hein at ronh@foresightresearch.com, or (248) 608-1870, Ext. 18. For help logging in to the members-only portions of the NMMA website, contact Bryan Welsh at bwelsh@nmma.org, or (312) 946-6276.